Disturbing: Researchers Finally Confirm That Cancer Is A Purely Man-Made Disease - ShareIt! Disturbing news comes from the University of Manchester; their researchers have made a shocking discovery which indicates that cancer is a purely man-made disease. Cancer is such a huge health problem worldwide, it is now estimated that in some parts of the world one in two people will develop cancer at some stage in their life. Cancer is spreading more and more rapidly as the years go by and in the UK alone it’s the main cause of over 150.000 deaths every year. According to statistics every third person in the UK is most likely to develop some type of cancer. This increased risk and the devastating consequences that happen as a result has inspired a team of researchers to dig in deep into the root cause of cancer, thoroughly researching mummies, fossils and classical literature and came to a stunning conclusion. According to them, cancer is a man-made disease, mostly fueled by the unhealthy way of life in the modern era. While studying Egyptian mummies, the team didn’t find any signs of cancer in any of them—with the exception of one isolated case. 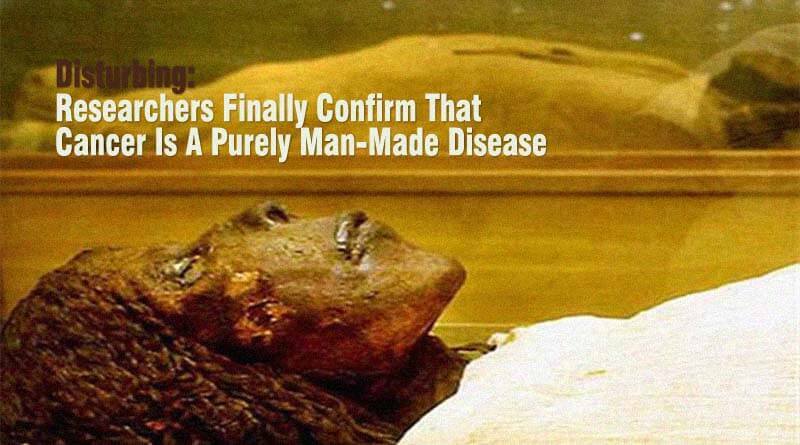 Pieces of tissue from hundreds of Egyptian mummies were rehydrated and observed under the microscope and they found only one case of cancer in all of the examined the mummies. Previously it was speculated that there were no cases of cancer in the ancient Egyptians because they didn’t live long enough. In order to rebut these claims the research team pointed out that other age-related disease, like hardening of the arteries and brittle bones, were common back then. Examining the ancient Egyptian manuscripts also didn’t reveal any evidence of cancer some cancer-like symptoms were probably associated with other diseases like leprosy or even varicose veins. According to their research, the first ones to define cancer as a disease were probably the Greeks, who also made the distinction between malignant and benign tumors. It wasn’t until the 17th century that the first description of surgeries for breast cancer and other types of cancers were mentioned. But he first reported cases of cancer, backed by scientific literature, are recorded in the last 200 years. Nasal cancer in snuff users appeared in 1761. Scrotal cancer in chimney sweeps was also discovered in 1775. “In industrialized societies, cancer is second only to cardiovascular disease as a cause of death. But in ancient times, it was extremely rare. There is nothing in the natural environment that can cause cancer. So it has to be a man-made disease, down to pollution and changes to our diet and lifestyle. They are certain that the main cause of cancer is man-related and recommend a healthier lifestyle, healthy diet and regular exercise as the key factors which can protect you from this disease. ← Retired Chief of a Pharmacy said: “ Alkaline Water Kills Cancer, The World Needs to Know” Here is How to Prepare it!